Angeline Poh of Singapore’s MDA (Media Development Authority) was at MIPCOM this past October to promote both production and distribution opportunities in Singapore and show off the advantages of the Asia TV Forum (ATF) for worldwide distribution companies. Poh stressed the fact that it has become an intra-Asian trading market, and distribution companies that are planning to attend or exhibit at ATF have to go “beyond program sales,” meaning explore new concepts and offer formats that resound with local audiences. “OTT in Asia are starting to invest in original concepts and are becoming more demanding because the Asian TV market is getting more sophisticated,” she added. The 16th edition of ATF will take place December 2-4, with a pre-market conference on December 1, at the Marina Bay Sands Complex in Singapore, its usual venue. In an internal survey shared with the press, market organizers asked 16 ATF-bound Asian buyers what kinds of programs they will be looking for. A large number indicated interest in children shows, followed by movies, lifestyle and documentaries, particularly scientific types. About 4,800 participants from 60 countries are expected to attend the event, which will start a week earlier than last year. Film industry-centric ScreenSingapore will once again be held alongside ATF. D.J. Lee, president of CJ E&M Media Contents Business, will deliver the keynote address on December 1. This year, there’s also a focus on kids entertainment and formats. To find out more about the event, VideoAge caught up with Yeow Hui Leng, senior project director at ATF organizer, Reed Exhibitions. 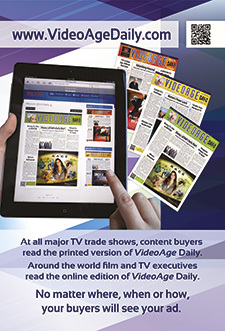 VideoAge: What’s new at the Asia TV Forum this year? Yeow Hui Leng: The overall ATF lineup this year presents a greater variety in the Asian countries covered, giving ATF 2015 a more holistic view of the industry in Asia. Last year’s edition hosted more than 71 speakers and 658 exhibitors and 2015’s ATF attendees can expect to be a part of the gears that are the great clockwork of Asian television. This year’s ATF offers an eclectic program, including discussions from brands pushing for the best digital strategy. Successful case studies are investigated, conjointly evaluating emerging challenges and opportunities, today’s risk, new business models, major investments and radical innovations. All these are presented from the business mindset at the pre-market conference on December 1. VA: There seemed to be growth in terms of Latin American and Canadian distributors between 2013 and 2014. Will that continue? Was that a conscious effort on your part? YHL: We believe that the growth will continue given the growing importance of the Asian markets. Last year at ATF, TV Azteca announced a co-production partnership with Astro, one of the leading players in Malaysia. Our outreach is to international distributors who have keen interest to Asian buyers. We are witnessing a growth in foreign distributors, not just from Latin America and Canada but also Europe. These regions are increasingly placing more emphasis on distributing content to Asia and expanding their global footprint. VA: How do you hope to expand the market? YHL: We have fostered an engaging business environment where industry players can easily acquire, engage regional or international content across all genres and platforms, find content, distributors, seek financiers and identify new co-production partners. ATF continuously strives to create new and relevant show features that are reflective of the industry trends; such as [email protected] where participants learn to create, develop market ideas with industry format experts and [email protected] where leading commissioners, financiers and buyers can uncover talent and new kid’s content. Held alongside ATF is the ScreenSingapore event, which serves the film community. ScreenSingapore will feature the new Southeast Asian Film Financing Project Market whereby 10 selected projects will be present at the market and be matched with financiers and commissioners. The entire TV and film community in Asia and beyond will gather in Singapore for a buzzing and synergistic week long of creative exchanges, deal making, networking and relationship building. VA: Which territories are best represented both in terms of buyers and sellers? YHL: With media professionals from 60 countries attending the Asia TV Forum & Market, the countries are pretty well represented. All our buyers are from Asia, which is the uniqueness of ATF, which serves to be your channel to tap onto the demands from Asian TV content industry. As for the sellers at ATF, the representation is fairly well distributed amongst Asia, Europe and America. VA: What would you like readers to know about the Asia TV Forum that they may not already? YHL: ATF is part of the Singapore Media Festival, which co-locates with other synergizing events such as the Singapore International Film Festival. Attendees can look forward to networking and interacting with the film financiers, distributors, regional directors and producers who will be in Singapore for the festival. Some of our exhibitor’s content will be represented at the festival.